By default, YouTube lets you upload videos to a maximum of 15 minutes. However, it is now easy to increase this limit and publish videos that have a duration of one or even two hours. To make this work, you need to validate your account with your phone number with Youtube.Then YouTube will allow you to upload videos to a maximum of 12 hours or 20GB size. Then you can upload HD videos in various formats. I think it will be great for those people who works in training or decide to upload one of their presentations. In principle, anyone with a YouTube account can increase the limit. All you need to validate account with mobile phone number. Now you can see the Upload video files window, where you can see the default option us “Upload HD videos in various formats up to 15 minutes“. Near to that option you will find a link that is named Increase your limit, click on it. Then Account verification window will appear, Enter your correct information like Country and mobile number. 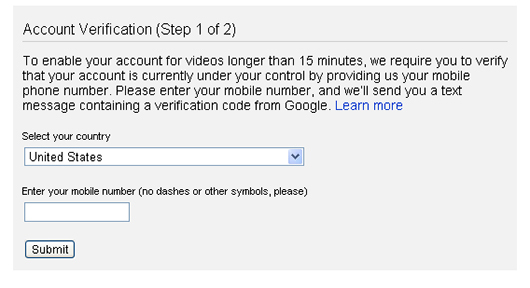 Youtube will send you verification code, which you will recive on your cell number. Enter the verification code. You’re done, 15 minutes limit should be gone. If you want to download videos then check this article – Top 10 Firefox Extensions to Download YouTube Videos. You can also download videos in HD formats. You can validate multiple accounts with your mobile phone. By cons, YouTube you in the eye. Remember that don’t upload the videos of copyright material, else you will receive a warning. You might even lose the privilege to post videos of long duration on Youtube. Previous: Google Doodle by Varsha Gupta on Children’s Day India!